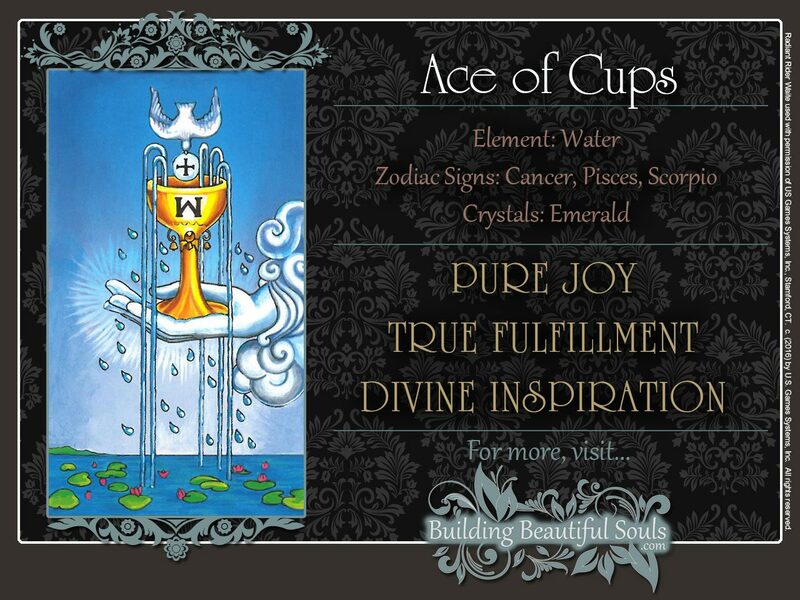 The Ace of Cups card announces true joy, fulfillment, and divine inspiration. Have you ever been so happy that all you could do was walk around with a goofy smile on your face all day long? Others may have asked you why, but you couldn’t really give them an intelligent answer. So you just shrugged your shoulders and kept on smiling. After all, it’s pretty hard to explain that the universe has struck just the right cord inside your soul. The Ace of Cups represents that feeling. Oh, no worries. You probably won’t be able to stop talking about it tomorrow. In fact, your subconscious is working overtime to put your feelings into words. The white dove, a symbol of divine love, descends from the heavens on the Ace of Cups to lower a round wafer stamped with an equal armed cross into a golden chalice. This chalice is presented to you by a hand emerging from a cloud. The message, the messenger, and the receiver are all divine. Oh, it gets even better: The chalice is your own subconscious mind. This is the moment when the divine spirit touches the individual mind, so the first impression that comes to mind – that of the Christian communion – can definitely be applied to the Ace of Cups. The equal armed cross represents perfect balance. On the Ace of Cups card, the arms of the cross point in the four cardinal directions, so comparing the wafer to the Native American Medicine Wheel is also appropriate – to a degree. Water is a symbol for the astral world, the meeting place of spirit and experience. The fact that five streams are pouring from the cup signifies that the divine inspiration received here will manifest itself physically through our five senses. 26 drops of water hover above the waters below. This is the numerical value of the Hebrew word Yud-Heh-Vav-Heh (God), a “formula” that also symbolizes the process of creation. There are also 26 letters in the English alphabet, meaning that abstract ideas are in the process of becoming words. The Ace of Cups is an excellent card to have in any reading, regardless of your current situation – or what any of the other cards may say. In the best of all worlds, the Ace of Cups’ energies bring pure joy, true fulfillment, and divine inspiration. In the worst scenario imaginable, the Ace of Cups Tarot is a message of comfort, allowing you to weather the most challenging crisis without fear. The suit of Cups is usually associated with questions about love. If you’re single, you’re about to meet someone very interesting. In fact, a chance encounter can very much lead to a long term commitment. If you already are in a committed relationship, the love and passion you feel for one another will even intensify. Are you trying to conceive a child? The timing is perfect. The cosmos is speaking to your subconscious mind with the Ace of Cups. A vague idea that could lead to big things is taking shape in your mind. Don’t dismiss it as a pipe dream. The lotus flowers on the waters of the Ace of Cups are clear signs that the impressions you are receiving are important divine communications. Be patient. Everything will make sense when the time is right. The symbolism of the Ace of Cups tarot card is so rich and complex, that its aspect of protection is often overlooked. W is the 23rd letter of the English alphabet. Okay, it won’t protect you from your own foolishness. Sticking your head into the lion cage at your local zoo is still a very bad idea. But if you’re being bullied at school or work, for example, you will meet powerful allies soon. That bully’s days are definitely numbered. Reversed cards mean bad news, right? Wrong! If the Ace of Cups card is reversed the universe is only telling you cool your jets. No matter how tense things may seem or how much you’re bubbling over with excitement over some good news, you need to chill out for a moment. Note how the waters in the Ace of Cups appear to be the source of the five stream. Like bungee cords, they are trying to pull the cup into the depths of your emotional world. Your emotions are important guides, but you can’t allow them to run your life. If it weren’t for the intervening hand of divine providence keeping it in place on the Ace of Cups, that cup would disappear into the waters. Push back hard enough and that hand will give way, leaving you at the mercy of your impulses and emotions. This can be risky, because in this state, you’re likely to do things you’ll regret later. Besides, it’s easier for others to manipulate you. Acknowledge your feelings, but don’t allow them to carry you away. The dew drops of inspiration are still floating toward the waters of your subconscious. It doesn’t matter which way the Ace of Cups card is facing. They will always end up where they’re supposed to. The bird is still carrying the wafer into the cup. When the Ace of Cups is reversed, the universe is drawing your attention to things you wouldn’t otherwise notice. For example, the “W” on the upturned chalice is now the letter M. According to Helena Blavatsky, this is the most sacred letter of the alphabet, because it combines male and female energies, symbolizing fertility – among other things. Keeping this in mind, the wafer on the Ace of Cups becomes the letter “O.” If your use the dove’s flight path as a guide, the ace’s true mystery, the word “Om” – Sanskrit “for God” and one of the most ancient mantras, or chants, used in meditation – is now revealed. Kabbalistically, the Ace of Cups – or Number 1 – of Cups symbolizes the pure essence of Water: intuition, emotion, the astral world, and the subconscious mind. In traditional numerology, this number is attributed to the life giving, divine fire of the sun. All aces also symbolize new beginnings.